Gate chamber at Mt. Tabor Reservoir 1, circa 1912. 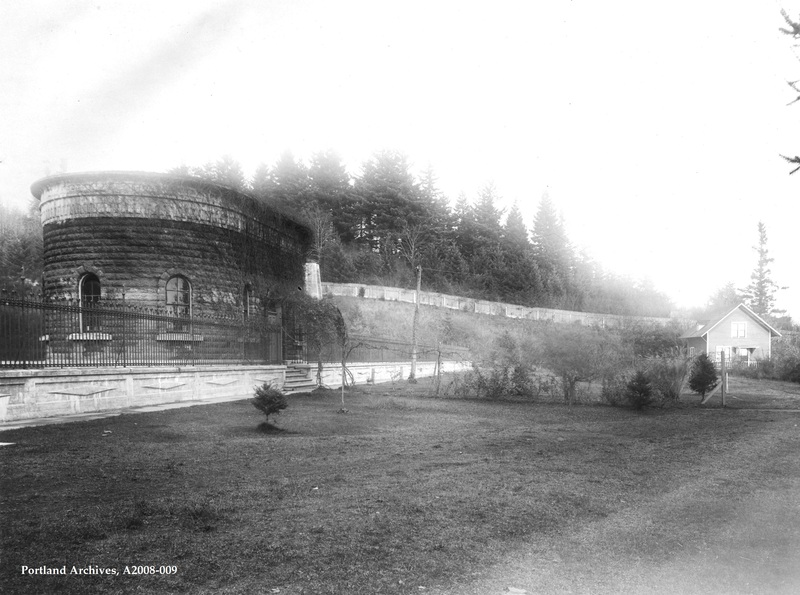 City of Portland (OR) Archives, Gate Chamber Reservoir 1, A2008-009, circa 1912. Which is Reservoir One on Mt Tabor? The large upper one? Reservoir One is the smaller one. Here is another link you may like. Try this link: I’ve compared this building to the other one on the larger reservoir and it appears to be this one, the smaller reservoir. Hope this link works! Just noticed something. If you zoom in on the old photo — those small evergreen trees on the hillside in the old picture — I bet those are the large 100 year old firs in the present day picture. Portland is a city of beautiful parks, and Mt. Tabor is one of the best. As it says in the park brochure, “The acquisition of parkland in Portland coincided directly with President Teddy Roosevelt’s campaign and policies for conservation that helped implement the National Parks Service and the U.S. Forest Service.” Kudos to turn-of- the-century Portland for establishing these wonderful parks that we all enjoy today! And the pairing of a beautiful park and reservoirs is a wonderful combination, Question: Is this gatehouse the one that is visible from Division St.? In the 1950s we used to visit granny in this neighborhood and I seem to remember peering from the back seat of Dad’s “57 Ford Fairlane at that unusual “rock-built” building with the ornate fence and roses and lawn fronting it. What happened to the little house in the old picture? Was this a caretakers quarters or something? That’s the statue of Harvey Scott on top of Tabor. That “Tiny House” in the photo was way ahead of the times.